Are you ready? I reflect on these couple verses found in the middle of Acts 21 and think of how many times I have been fearful, lacked trust, listened to the world, or allowed myself to be influenced by others. To focus on me and not do the, “Will of the Lord“. My personal excuses in these moments could include; I wasn’t ready yet, no time, over-extended, or, afraid of a perception that others would possibly judge me by. I can be lost or selfishly looking at me at times without letting the will of our Lord take hold of all aspects of my life. Today, as we continue to grow in the wisdom of what Paul shares with us in Acts, we can be encouraged to show courage. Paul shows how not to be afraid and to share His word even when fear can be on the horizon. Be inspired! This courage found in Paul is inside of all of us! Think, what if when Agabus approached Paul and other believers, after taking Paul’s belt for the purposes of modeling to him the bounding that was going to transpire. What if Paul in that moment said, “You know what Agabus, your right let’s stop spreading the good news.” No way!!! Paul’s faith and God’s grace gave him courage. Think, How many eternal lives would of been lost if Paul didn’t do the Lord’s will. As a staff our school has been reading a book called Move Your Bus written by Ron Clark. In this book there is a parable about a bus that doesn’t have a gas tank but moves based on those that are on the bus. In the book these people can consist of; runners, joggers, walkers, riders, and the driver. I share this story because I think of Paul. Paul is a runner. He is not walking, going for the ride, or choosing his moments to run. He is a full-time runner. He’s ready for anything. Whatever needs to be done, and when it needs doing. Paul is there ready to work without persuasion. He simply loves God and knows the only way for others to get to have a relationship with Him is through sharing the truth. Paul doesn’t give in or decide to remain silent. He knew God’s will for him. It’s hard for me to say no. I want to do as much as I can for God, family, friends, and others. But, when God is not involved I can struggle with knowing what is for me and what is for Him. Help our desires to be on Him. I love verse 15 that follows. (15)And after those days we took up our carriages, and went up to Jerusalem. Paul’s courage has an impact on others. After pleading with Paul to not go to Jerusalem, and Paul saying basically too bad, I’m doing the Lord’s will. The rest of the group who all wanted to turn around joined Paul in his mission. That’s leadership. His courage affected them. 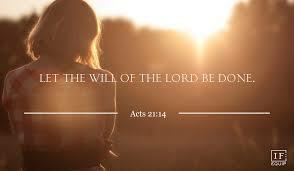 God’s will!